An effect is the result of something. It is an outcome, a result, a reaction, a change in Y brought about by a change in X. 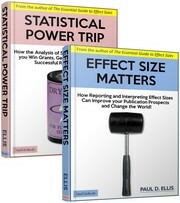 An effect size refers to the magnitude of the result as it occurs, or would be found, in nature, or in a population. Although effects can be observed in the artificial setting of a laboratory or a sample, effect sizes exist in the real world. When researchers estimate effect sizes by observing representative samples, they generate an effect size estimate. This estimate is usually expressed in the form of an effect size index. This entry was posted on Monday, May 31st, 2010 at 2:21 am and is filed under effect size. You can follow any responses to this entry through the RSS 2.0 feed. Both comments and pings are currently closed. 8 Responses to What is an effect size? What does a negative effect size tell me? The sign reveals the direction of the effect. A negative r indicates a negative correlation; a negative d indicates the effect is bigger for the second group. I am not sure if you are checking this site.But can we use effect size to measure different measures? For example, we measure muscle growth via lean body mass, CSA, tape measure. So can we use effect size to combine these measurements and show the effect size? I think you are confusing the measurement of effects with the measurement of variables. Do you have a particular effect in mind? From what I understand, he means effect size can be used to measure different measures of muscle growth and be compared. Is this true? If you are releasing a second edition , I have some suggestions. Now I understand. This is the apples and and oranges problem I discuss on p.98 of the book. The author is interested in the effect of X (set volume – whatever that is) on Y (hypertrophy) but since the measurement of Y varies across studies, he is not sure that direct comparisons are possible. The solution he proposes (calculating standardized ES) does not deal with this particular problem but the problem of comparing results effects (not variables) that have been reported in different metrics. Hi Paul, I checked page 98, but it didn’t say much. So are you saying we can use effect size as the author has used or you can’t? The measurements are in different units. I thought effect sizes measurements need to be for the same units. Pages 99-101 discuss the reasons and methods for converting study-specific ES estimates into a common metric. Page 98 lists several tactics for making sure you don’t have an apples and oranges problem in the first place. If you need further information, any good meta-analysis textbook will have chapters on these issues. Some are listed in the Bibliography.